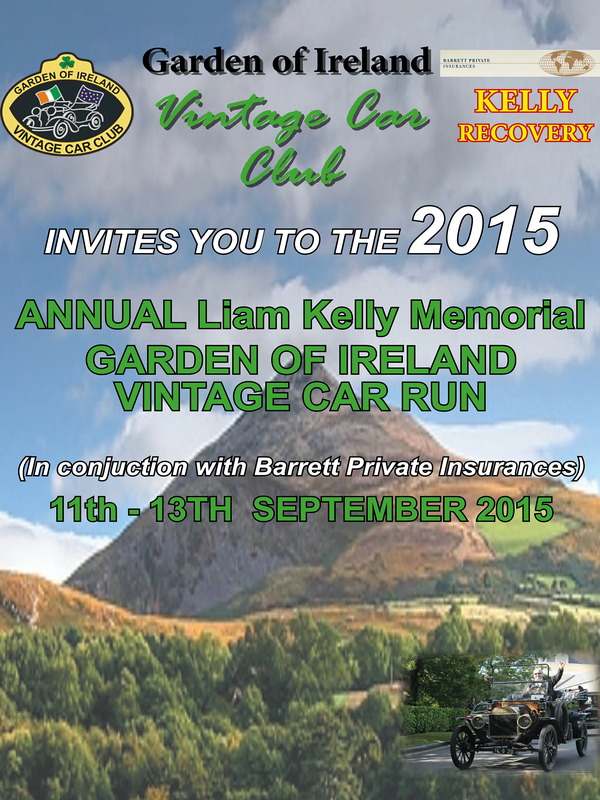 Please find a Link below for Our entry Form to the Annual Liam Kelly Memorial Run. Or Post it to the Address Shown on the Form…. 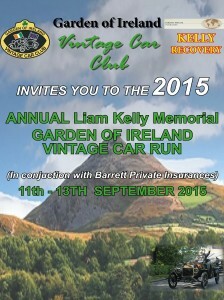 Memorial Garden of Ireland run on the 12th. and 13th. 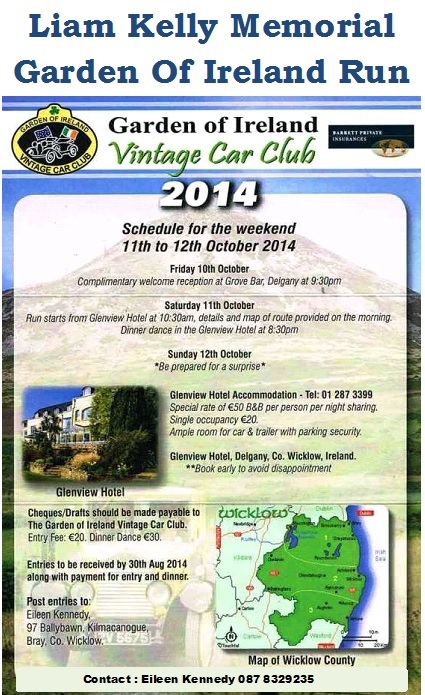 of September at the Glenview Hotel. 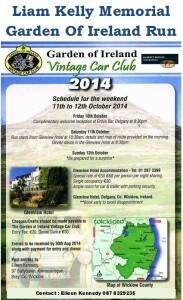 This year The Garden of Ireland Vintage Car Club held their re-named run over the weekend of the 11th and 12th October 2014. The weekend commenced with a reception at the club’s headquarters, The Grove Bar, Kilpeddar on Friday night and a great night was had by all. On a sun soaked Saturday morning a record number of cars from the four corners of Ireland and abroad departed the Glenview Hotel for a run where the organisers showcased the beautiful county of Wicklow. With the help of Pat Moran and the North Wicklow Motor cycle Enthusiasts and Kelly Recovery a very pleasant incident free day was had by all. After the finishers awards were presented at The Grove Bar our guests departed to prepare for our dinner dance at The Glenview Hotel that night, this was a very enjoyable night with music provided by Press Play. The car of the run Liam Kelly Perpetual Trophy was presented by Mrs. Bridget Kelly to club member Eric Byrne for his beautiful 1950 MK5 Jaguar. Sunday was another beautiful day and the cars again departed from The Glenview Hotel for a Surprise Poker Run sponsored by Eamon Kelly of Kelly Recovery Services and this was thoroughly enjoyed by all and after the winners were announced our visitors departed with lasting memories of Wicklow and another great weekend with most of our guests promising to return on 12th and 13th September 2015 for next year’s run. The organising committee went to great lengths to ensure an excellent event for All of those taking part. Over 90 vehicles took part coming from all corners of the South, North and UK. Thanks to the excellent planning on the part of the organising committee and brilliant sunshine throughout, the rally was a huge success and a good time was had by all who attended. 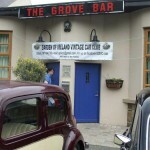 The event began in The Grove Bar, Willow Grove on Friday night with a reception hosted by the club. A stunning 1956 Mercedes 190SL owned by Frank Bove of Carrick on Suir won the car of the show award. 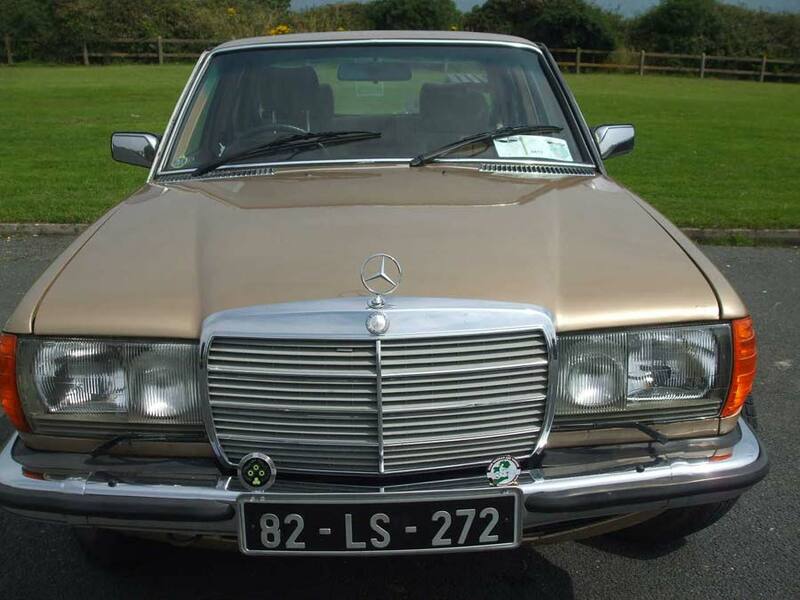 This Irish registered car has a special link to Wicklow as it paraded Arklow born Ronnie Delaney through the crowds after his historic gold in the 1956 Melbourne Olympics. Due to the high standard of entrants this year there was great competition for this prize sponsored by Liam Kelly. 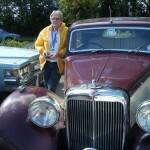 The prestigious Garden of Ireland Vintage Car Club was formed 6 years ago by a small group of people who had a passion for older cars. 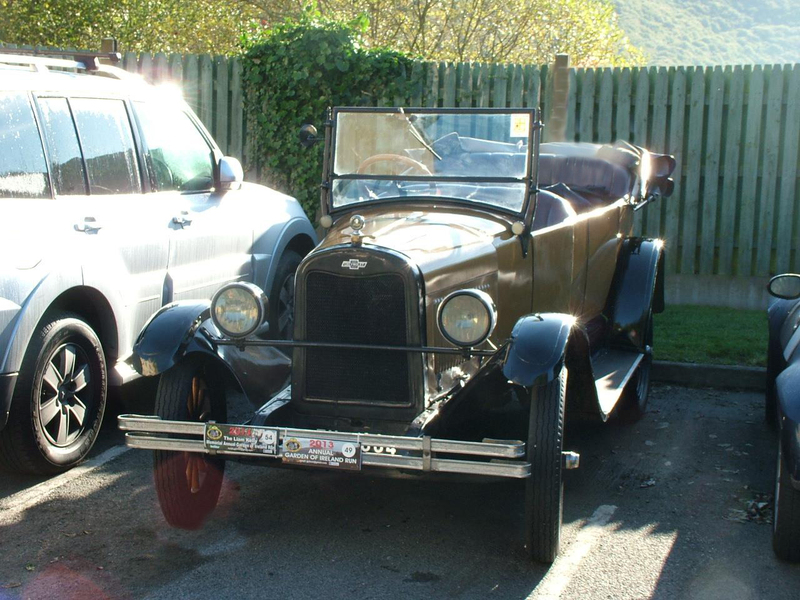 Since its inception, the club has gone from strength to strength and now boasts membership of over 80 enthusiasts with a display of vintage and classic cars dating from 1914 to the early eighties. The Club meets on the third Monday of each month and have had a very successful year to date which included a visit to Ballybrit where the club took part in The Help Emma Beat It Fund Day along with many other local and national runs. We would like to most sincerely thank our sponsors, The Community Tourism Diaspora Project, Wicklow County Council, Barrett Private Insurances, The Kelly Family, Paul Clark of East Coast Gas and The Glenview Hotel, we are deeply grateful for their support in making this a successful event. Thank you to those who have supported us over the years and also to those who are joining us for the first time, we have no doubt that you will enjoy our hospitality and the spectacular scenery of Co. Wicklow. Make sure that you have checked in and that you are aware of the departure time. A Tow Truck and Pat Moran’s team of outriders will be available throughout the run. Included in the information pack you will find a voting slip for “Your Favourite Car of the Day” for The Liam Kelly Memorial Perpetual Trophy which is being sponsored by The Kelly Family. This will be presented at the Dinner Dance. Chairperson: Willie Carrick, Vice Chairperson, Michael Nolan. Secretary, Eileen Kennedy, Treasurer, Charlotte Carolan, PRO, Ann Nolan, Safety Officer, Colin Gammell, Events Co-ordinator, Shay Duffy. Liam Kelly Memorial 2014 preview snippets from Jack Epstein Productions on Vimeo. The Liam Kelly DVD is available now from Eileen on 087 8329235. 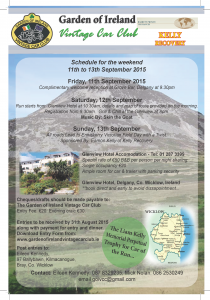 Please click to download the entry form for our 2014 ENTRY FORM FOR GARDEN OF IRELAND RUN. 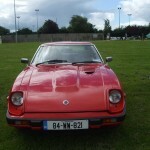 Post by Garden of Ireland Vintage Run. 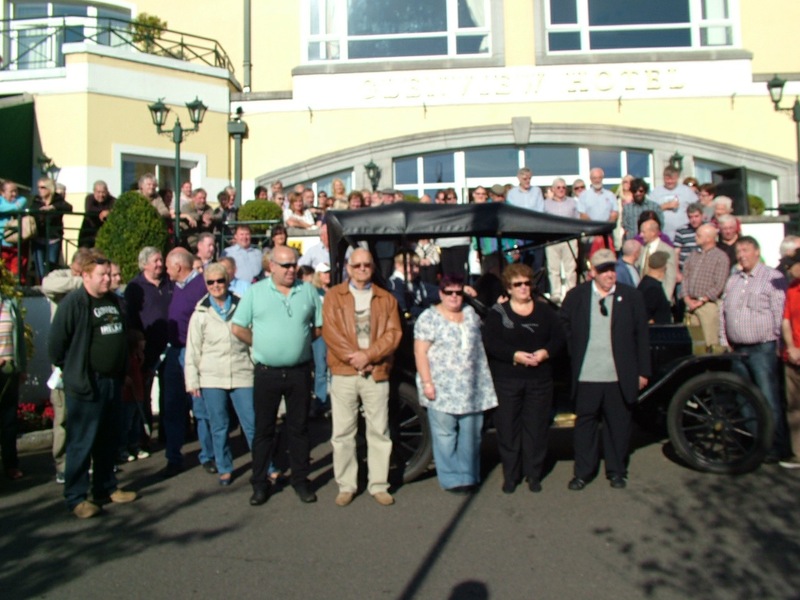 The rally started at The Glenview Hotel on Saturday morning to the delight of many spectators who gathered to view the cars, including Mrs Kelly of Bray who is a sprightly 87 years old and Mrs Morgan of Newry who is a sprightly 81 years old. Our best wishes to these two wonderful ladies. Participants were welcomed to Co Wicklow by Eileen Whelan of RTE Fame and Councillor Pat Casey, Chairperson of The Gathering who wished them a very enjoyable weekend. 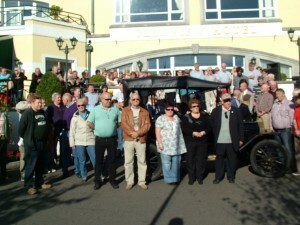 Following lunch at the Avon Ri Hotel in Blessing ton participants began their journey back to the Grove bar for refreshments and presentations. This was followed by a Gala Dinner Dance with music by the very popular Brendan Kennedy Band. After a short run on Sunday and lunch at Garden World, Kilquade our visitors returned home feeling very happy and relaxed and with many fond memories of both old and new friends .